Gina Cheri Haspel (née Walker, October 1, 1956) is an American intelligence officer serving as Director of the Central Intelligence Agency (CIA) since 2018. She is the first woman to hold the post on a permanent basis and was previously the Deputy Director under Mike Pompeo during the early presidency of Donald Trump. She became Acting Director following Pompeo's resignation to become United States Secretary of State and was nominated by President Donald Trump to become the official Director of the CIA. On May 17, 2018, she was confirmed as the Director of the CIA, making her the first female Director of the CIA in history. She was officially sworn as Director of the CIA on May 21, 2018. She was also the second female Deputy Director of the agency. Haspel has attracted controversy for her role as chief of a CIA black site in Thailand in 2002 in which prisoners were tortured with so-called "enhanced interrogation techniques", including waterboarding. At that time, the Bush Administration considered the techniques legal based on a set of secret, now-rescinded legal opinions that expansively defined executive authority and narrowly defined torture. 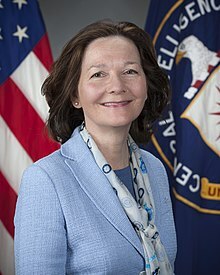 Haspel's involvement in enhanced interrogation techniques was confirmed in August 2018 when a Freedom of Information lawsuit by the George Washington University-based National Security Archive brought to light CIA cables either authorized by or written by Haspel while base chief at the Thailand black site. The cables describe acts of deliberate physical torture of detainees, including waterboarding and confinement. Haspel was born Gina Cheri Walker on October 1, 1956 in Ashland, Kentucky. Her father served in the United States Air Force. She has four siblings. Haspel attended high school in the United Kingdom. She was a student at the University of Kentucky for three years and transferred for her senior year to the University of Louisville, where she graduated in May 1978 with a BS degree in languages and journalism. From 1980 to 1981, she worked as a civilian library coordinator at Fort Devens in Massachusetts. She received a paralegal certificate from Northeastern University in 1982 and went on to work as a paralegal until she was hired by the CIA. Haspel joined the CIA in January 1985 as a reports officer. She held several undercover overseas positions, for many of which she was station chief. Her first field assignment was from 1987–1989 in Ethiopia, Central Eurasia, Turkey, followed by several assignments in Europe and Central Eurasia from 1990 to 2001. From 1996 to 1998, Haspel served as station chief in Baku, Azerbaijan. From 2001 to 2003, her position was listed as Deputy Group Chief, Counterterrorism Center. Between October and December 2002, Haspel was assigned to oversee a secret CIA prison in Thailand Detention Site GREEN, code-named Cat's Eye, that housed persons suspected of involvement in Al-Qaeda. The prison was part of the US government's extraordinary rendition program after the September 11 attacks, and used "enhanced interrogation techniques" such as waterboarding that are widely considered to be torture, although those methods were deemed legal at the time by agency lawyers. According to a former senior CIA official, Haspel arrived as station chief after the interrogation of Abu Zubaydah but was chief during the waterboarding of Abd al-Rahim al-Nashiri. 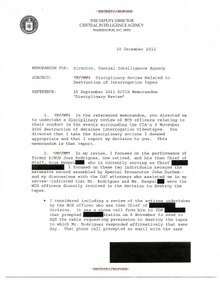 On January 8, 2019, Carol Rosenberg, of the Miami Herald, reported that partially redacted transcripts from a pre-trial hearing of Guantanamo Military Commission of Khalid Sheikh Mohammed, seemed to indicate that Haspel had been the "Chief of Base" of a clandestine CIA detention site on the Guantanamo Bay Naval Station, in the 2003-2004 period. In late October 2002, Haspel became a chief of base for a "black site" CIA torture prison located in Thailand. She worked at a site that was codenamed "Cat's Eye", which would later become known as the place where suspected al Qaeda terrorist members Abd al-Rahim al-Nashiri and Abu Zubaydah were detained and tortured with waterboarding. In early February 2017, The New York Times and ProPublica reported that these waterboardings were both conducted under Haspel. In March 2018, U.S. officials said that Haspel was not involved in the torture of Zubaydah, as she only became chief of base after Zubaydah was tortured. ProPublica and The New York Times issued corrections to their stories but noted that Haspel was involved in the torture of al-Nashiri. In August 2018, cables from the site, dating from November 2002 and likely authorized by if not written by Haspel, were released because of a Freedom of Information lawsuit, and they describe the torture of Nashiri in detail, including slamming him against a wall, confining him to a small box, waterboarding him, and depriving him of sleep and clothing, while threatening to turn him over to others who would kill him and calling him "a little girl," "a spoiled little rich Saudi," and a "sissy." Haspel played a role in the destruction of 92 interrogation videotapes that showed the torture of detainees both at the black site she ran and other secret agency locations. A partially-declassified CIA document shows that the instruction for a new method of record keeping at the black site in Thailand, re-recording over the videos, took place in late October 2002, soon after Base Chief Haspel's arrival. On December 17, 2014, the European Center for Constitutional and Human Rights (ECCHR) pressed criminal charges against unidentified CIA operatives, after the US Senate Select Committee published its report on torture by US intelligence agencies. On June 7, 2017, the ECCHR called on the Public Prosecutor General of Germany to issue an arrest warrant against Haspel over claims she oversaw the torture of terrorism suspects. The accusation against her is centered on the case of Saudi national Abu Zubaydah. Jameel Jaffer of the American Civil Liberties Union described Haspel as "quite literally a war criminal." On May 1, 2018, Spencer Ackerman, writing in The Daily Beast, reported that former CIA analyst Gail Helt had been told that some of the controversial torture recordings had not been destroyed, after all. On May 9, 2018, the day prior to her confirmation vote, The New York Times reported that Khalid Sheikh Mohammed, architect of the 9/11 attacks and victim of various forms of torture, requested to submit six paragraphs of information for the Senate committee to review before its vote. From 2004 to 2005, Haspel was Deputy Chief of the National Resources Division. After the service in Thailand, she served as an operations officer in Counterterrorism Center near Washington, DC. She later served as the CIA's station chief in London and, in 2011, New York. Haspel served as the Deputy Director of the National Clandestine Service, Deputy Director of the National Clandestine Service for Foreign Intelligence and Covert Action, and Chief of Staff for the Director of the National Clandestine Service. In 2005, Haspel was the chief of staff to Jose Rodriguez, Director of the National Clandestine Service. In his memoir, Rodriguez wrote that Haspel had drafted a cable in 2005 ordering the destruction of dozens of videotapes made at the black site in Thailand in response to mounting public scrutiny of the program. At the Senate confirmation hearing considering her nomination to head the CIA, Haspel explained that the tapes were destroyed in order to protect the identities of CIA officers whose faces were visible, at a time when leaks of US intelligence were rampant. In 2013, John Brennan, then the director of Central Intelligence, named Haspel as acting Director of the National Clandestine Service, which carries out covert operations around the globe. However, she was not appointed to the position permanently due to criticism about her involvement in the Rendition, Detention and Interrogation program. Her permanent appointment was opposed by Dianne Feinstein and others in the Senate. With more than thirty years of service to the CIA and extensive overseas experience, Gina has worked closely with the House Intelligence Committee and has impressed us with her dedication, forthrightness, and her deep commitment to the Intelligence Community. She is undoubtedly the right person for the job, and the Committee looks forward to working with her in the future. I am especially concerned by reports that this individual was involved in the unauthorized destruction of CIA interrogation videotapes, which documented the CIA's use of torture against two CIA detainees. My colleagues Senators Wyden and Heinrich have stated that classified information details why the newly appointed Deputy Director is 'unsuitable' for the position and have requested that this information is declassified. I join their request. On February 15, 2017, Spencer Ackerman reported on psychologists Bruce Jessen and James Mitchell, the architects of the "enhanced interrogation" program that was designed to break Zubaydah and was subsequently used on other detainees at the CIA's secret prisons around the world. Jessen and Mitchell are being sued by Sulaiman Abdulla Salim, Mohamed Ahmed Ben Soud, and Obaid Ullah over torture designed by the psychologists. Jessen and Mitchell are seeking to compel Haspel, and her colleague James Cotsana, to testify on their behalf. On March 13, 2018, President Donald Trump announced he would nominate Haspel to be the Director of the Central Intelligence Agency, replacing Mike Pompeo—whom he tapped to become the new Secretary of State. Once confirmed by the Senate, Haspel became the first woman to serve as permanent Director of the CIA (Meroe Park served as Associate Deputy Director from 2013-2017 and acting director for three days in January 2017). Robert Baer, who supervised Haspel at the Central Intelligence Agency, found her to be "smart, tough and effective. Foreign liaison services who have worked with her uniformly walked away impressed." Republican Senator Rand Paul stated that he would oppose the nomination saying "To really appoint the head cheerleader for waterboarding to be head of the CIA? I mean, how could you trust somebody who did that to be in charge of the CIA? To read of her glee during the waterboarding is just absolutely appalling." Soon after Paul made this statement, the allegation that Haspel mocked those being interrogated was retracted. Doug Stafford, an aide for Rand Paul, said, "According to multiple published, undisputed accounts, she oversaw a black site and she further destroyed evidence of torture. This should preclude her from ever running the CIA." Republican Senator and former presidential candidate John McCain called on Haspel to provide a detailed account of her participation in the CIA's detention program from 2001–2009, including whether she directed the use of so-called "enhanced interrogation techniques" and to clarify her role in the 2005 destruction of interrogation videotapes. In the Senate, McCain was a staunch opponent of torture, having been tortured as a prisoner of war in North Vietnam. McCain further called upon Haspel to commit to declassifying the 2014 Senate Intelligence Committee report on CIA torture. Multiple senators have criticized the CIA for what they believe is selectivity in declassifying superficial and positive information about her career to generate positive coverage, while simultaneously refusing to declassify any "meaningful" information about her career. More than 50 former senior U.S. government officials, including six former Directors of the CIA and three former directors of national intelligence, signed a letter supporting her nomination. They included former Directors of the CIA John Brennan, Leon Panetta and Michael Morell, former Director of the NSA and CIA Michael Hayden, and former Director of National Intelligence James Clapper. In April, a group of 109 retired generals and admirals signed a letter expressing "profound concern" over Haspel's nomination due to her record and alleged involvement in the CIA's use of torture and the subsequent destruction of evidence. Fairness and Accuracy in Reporting criticized the press coverage that portrays Haspel's nomination as a victory for feminism. On May 10, The Washington Post Editorial Board expressed its opposition to Ms. Haspel's nomination for not condemning the CIA's now-defunct torture program as immoral. On May 12, the first two Senate Democrats, Joe Donnelly of Indiana and Joe Manchin of West Virginia, announced their support for Haspel's nomination. On May 9, 2018, Haspel appeared before the Senate Intelligence Committee for a confirmation hearing. 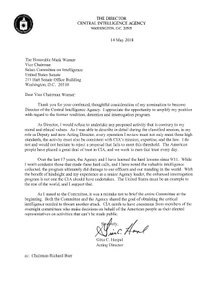 On May 14, Haspel sent a letter to Sen. Mark Warner of Virginia stating that in hindsight, the CIA should not have operated its interrogation and detention program. Shortly thereafter, Sen. Warner announced he would back Haspel when the Senate Intelligence Committee voted on whether to refer her nomination to the full Senate. She was approved for confirmation by the Senate Intelligence Committee on May 16 by a 10–5 vote, with two Democrats voting in favor. The next day, Haspel was confirmed by the full Senate, on a mostly party-line, 54–45 vote. Paul and Jeff Flake of Arizona were the only Republican nays, and six Democrats — Joe Donnelly, Joe Manchin, Mark Warner, Heidi Heitkamp of North Dakota, Bill Nelson of Florida, and Jeanne Shaheen of New Hampshire — voted yes. McCain, who had urged his colleagues to reject her nomination, did not cast a vote, as he was hospitalized at the time. Haspel was officially sworn in on May 21, 2018 becoming the first woman to serve as Director of the Central Intelligence Agency on a permanent basis. On January 29, 2019, during a Senate Intelligence Committee hearing, Haspel reported that the CIA was "pleased" with the Trump administration's March 2018 expulsion of 61 Russian diplomats following the poisoning of Sergei and Yulia Skripal. Haspel added that the CIA did not object to the Treasury Department’s decision in December 2018 to remove sanctions on three Russian companies tied to Russian oligarch Oleg Deripaska, a close associate of Russian President Vladimir Putin. On the subject of recent relations between North Korea and the United States, Haspel stated, "I think our analysts would assess that they value the dialogue with the United States, and we do see indications that Kim Jong-un is trying to navigate a path toward some kind of better future for the North Korean people." Haspel has received a number of awards, including the George H. W. Bush Award for excellence in counterterrorism, the Donovan Award, the Intelligence Medal of Merit, and the Presidential Rank Award. Haspel married Jeff Haspel, who served in the United States Army, c. 1976; they were divorced by 1985. Haspel currently lives in Ashburn, Virginia. She does not use social media. ^ "Gina Haspel Assumes Role of Acting Director of the Central Intelligence Agency" (Press release). Central Intelligence Agency. April 26, 2018. Retrieved May 2, 2018. ^ "Gina Haspel Selected to be Deputy Director of CIA". Central Intelligence Agency. February 2, 2017. Archived from the original on February 3, 2017. Retrieved February 2, 2017. Ms. Haspel is the first female career CIA officer to be named Deputy Director. ^ a b Glenn Greenwald (February 2, 2017). "The CIA's New Deputy Director Ran a Black Site for Torture". The Intercept. Retrieved February 3, 2017. That CIA official's name whose torture activities the Post described is Gina Haspel. Today, as BuzzFeed's Jason Leopold noted, CIA Director Mike Pompeo announced that Haspel was selected by Trump to be Deputy Director of the CIA. ^ a b "Gina Haspel becomes first female CIA deputy director". WDSU. February 2, 2017. Archived from the original on February 2, 2017. Retrieved February 3, 2017. ^ Harris, Shane (May 17, 2018). "Gina Haspel confirmed as CIA chief despite scrutiny of her role in interrogation program". The Washington Post. Retrieved May 17, 2018 – via MSN. The Senate voted Thursday to confirm Gina Haspel as the next CIA director after several Democrats were persuaded to support her despite lingering concerns about her role in the brutal interrogation of suspected terrorists captured after 9/11. ^ News, VOA. "Veteran Spy Haspel Sworn In as New CIA Chief". ^ Berenson, Tessa (March 13, 2018). "Who Is Gina Haspel, President Trump's Pick for CIA Director?". Time. Retrieved March 13, 2018. ^ Suman Varandani (February 3, 2017). "Who Is Gina Haspel? 5 Facts About Trump's CIA Deputy Director Pick". International Business Times. Retrieved February 3, 2017. Haspel joined the Central Intelligence Agency in 1985, and spent most of her career undercover. She has been part of several controversies, including her involvement in several torture programs conducted by the U.S. She also ran waterboarding and other interrogation techniques at some of CIA's "black sites" or secret prisons. She has not yet been indicted for war crimes. ^ Paul Handley (February 2, 2017). "Woman tied to secret interrogations to be CIA No. 2". Washington DC: Yahoo News. Archived from the original on February 4, 2017. Retrieved February 3, 2017. A longtime CIA clandestine operations official reportedly involved in its much-criticized "black site" interrogations after the 9/11 attacks was named number two at the US spy agency Thursday. ^ a b Holpuch, Amanda (March 13, 2018). "Who is Gina Haspel? Trump's pick for CIA chief linked to torture site". The Guardian. ^ a b Allen, Nick (March 13, 2018). "Gina Haspel: Donald Trump's new CIA director ran torture site in Thailand". The Daily Telegraph. ^ a b Washington, Boer Deng (March 14, 2018). "New CIA chief Gina Haspel helped run torture site in Thailand". The Times. ^ Ward, Alex (March 13, 2018). "Gina Haspel, Trump's CIA director pick, oversaw the torture of dozens of people". Vox. ^ Mora, Alberto (March 15, 2018). "Gina Haspel Is a Torturer. What Else Does the Senate Need to Know?". Politico Magazine. Retrieved March 16, 2018. ^ Peralta, Eyder (December 16, 2014). "'Torture Report': A Closer Look At When And What President Bush Knew". NPR. Retrieved May 15, 2018. ^ "Bush on waterboarding: 'Damn right'". CNN. November 5, 2010. Retrieved May 15, 2018. ^ Tom Blanton, ed. (August 10, 2018). "Gina Gaspel CIA Torture Cables Declassified". National Security Archive. Retrieved August 10, 2018. ^ "CIA chief Gina Haspel faces a grilling". The Australian. March 18, 2018. Even the most basic facts about Ms Haspel's life are hard to establish. She was born Gina Cherie [sic] Walker in Kentucky in 1956. At 20, she married Jeff Haspel, an army officer, but they were divorced by the time she joined the CIA in 1985 as a reports officer, specializing in Russia. By 1988, she was listed as "acting head of administration" at the US embassy in Addis Ababa. ... Her subsequent postings remain classified but she was based in Ankara in 2003 and was CIA station chief in New York. ^ a b c "Haspel's nomination questionnaire" (PDF). Senate Intelligence Committee. Archived from the original (PDF) on May 9, 2018. Retrieved May 9, 2018. ^ Myre, Greg (April 20, 2018). "The CIA Introduces Gina Haspel After Her Long Career Undercover". NPR. Retrieved April 27, 2018. ^ "Get to Know our Deputy Director". CIA. March 23, 2018. Retrieved April 27, 2018. ^ a b c "CIA chief Gina Haspel faces a grilling". The Australian. March 18, 2018. Even the most basic facts about Ms Haspel's life are hard to establish. She was born Gina Cherie [sic] Walker in Kentucky in 1956. At 20, she married Jeff Haspel, an army officer, but they were divorced by the time she joined the CIA in 1985 as a reports officer, specialising in Russia. By 1988, she was listed as "acting head of administration" at the US embassy in Addis Ababa. ... Her subsequent postings remain classified but she was based in Ankara in 2003 and was CIA station chief in New York. ^ a b c d e f g Gazis, Olivia (May 1, 2018). "CIA Director nominee Gina Haspel: CIA releases timeline of her clandestine career". CBS News. Retrieved May 1, 2018. ^ a b c Toosi, Nahal (February 2, 2017). "Trump taps former 'black site' prison operator for CIA deputy". Politico. ^ a b c "Gina Haspel". Central Intelligence Agency. Archived from the original on March 14, 2018. Retrieved March 13, 2018. ^ a b Stein, Jeff (March 13, 2018). "Trump's new CIA Director Nominee embraced Waterboarding, but Torture not likely to return at the Agency". Newsweek. Retrieved March 27, 2018. ^ a b c d e Goldman, Adam (March 13, 2018). "Gina Haspel, Trump's Choice for C.I.A., Played Role in Torture Program". The New York Times. Retrieved March 14, 2018. ^ Carol Rosenberg (January 8, 2019). "Did CIA Director Gina Haspel run a black site at Guantánamo?". McClatchy News Service. Guantanamo. Archived from the original on January 8, 2019. The claim by Rita Radostitz, a lawyer for Khalid Sheik Mohammed, appears in one paragraph of a partially redacted transcript of a secret hearing held at Guantánamo on Nov. 16. Defense lawyers were arguing, in a motion that ultimately failed, that Haspel’s role at the prison precludes the possibility of a fair trial for the men accused of orchestrating the 9/11 attacks who were also held for years in covert CIA prisons. ^ Riechmann, Deb (February 2, 2017). "Seasoned spymaster linked to waterboarding named CIA deputy". San Francisco Chronicle. AP. Archived from the original on February 28, 2017. ^ a b c Bonner, Raymond (March 15, 2018). "Correction: Trump's Pick to Head CIA Did Not Oversee Waterboarding of Abu Zubaydah". ProPublica. Archived from the original on March 16, 2018. Retrieved March 16, 2018. ^ a b Miller, Greg (February 2, 2017). "CIA officer with ties to 'black sites' named deputy director". The Washington Post. Retrieved February 3, 2017. ^ a b Rosenberg, Matthew (February 2, 2017). "Gina Haspel, C.I.A. Deputy Director, Had Role in Torture". The New York Times. Retrieved March 17, 2018. ^ Bonner, Raymond (February 22, 2017). "CIA Cables Detail Its New Deputy Director's Role in Torture". ProPublica. Archived from the original on February 22, 2017. Retrieved February 22, 2018. ^ Barnes, Julian; Shane, Scott (August 10, 2018). "Cables Detail C.I.A. Waterboarding at Secret Prison Run by Gina Haspel". New York Times. Retrieved August 10, 2018. ^ Mazzetti, Mark (December 7, 2007). "C.I.A. Destroyed 2 Tapes Showing Interrogations". The New York Times. ^ Parton, Heather Digby (March 17, 2018). "New Report on CIA Nominee Gina Haspel May Rescue Her – But It Shouldn't". Salon.com. Retrieved March 25, 2018. ^ Prados, John (May 9, 2018). "The CIA Black Sites Program and the Gina Haspel Nomination". The National Security Archive. ^ "The National Security Archive". nsarchive2.gwu.edu. ^ Knight, Ben (June 7, 2017). "NGO seeks arrest warrant for Donald Trump's deputy CIA director". Deutsche Welle. ^ "Rights Group Asks Germany to Arrest CIA Deputy Director". U.S. News & World Report. AP. June 7, 2017. ^ Fuchs, Christian (June 7, 2017). "CIA: Trump's Darling". Die Zeit. ^ Miller, Greg; Harris, Shane (March 13, 2018). "Gina Haspel, Trump's pick for CIA director, tied to use of brutal interrogation measures". The Washington Post. ^ O'Brien, Cortney (March 13, 2018). "Critics Label Trump's New CIA Director a 'War Criminal'". Townhall. Retrieved March 15, 2018. ^ Spencer Ackerman (May 1, 2018). "Ex-CIA Official Says Some Torture Videotapes May Still Exist". Daily Beast. Retrieved May 1, 2018. But the now-retired analyst, Gail Helt, said she memorialized their conversation in a notebook she kept at the time, a copy of which The Daily Beast has seen. Haspel's nomination has compelled her to disclose what she heard, Helt said. ^ Savage, Charlie (May 8, 2018). "9/11 Planner, Tortured by C.I.A., Asks to Tell Senators About Gina Haspel". The New York Times. Retrieved May 8, 2018. ^ a b Mazzetti, Mark (May 7, 2013). "New Head of C.I.A. 's Clandestine Service Is Chosen". The New York Times. Retrieved March 14, 2018. ^ Taddonio, Patrice (May 9, 2018). "CIA Director Nominee Supported Destruction of Torture Tapes". Frontline. PBS. Retrieved May 16, 2018. ^ Filkins, Dexter (February 3, 2017). "The New CIA Deputy Chief's Black-Site Past". The New Yorker. Retrieved March 15, 2018. ^ Miller, Greg (May 7, 2013). "National Security CIA selects new head of clandestine service, passing over female officer". The Washington Post. ^ Johnson, Tim (February 2, 2017). "New CIA deputy director is 1st career female officer in the post". Miami Herald. Retrieved March 13, 2018. ^ Nunes, Devin (February 2, 2017). "Nunes Statement on Appointment of Gina Haspel as CIA Deputy Director" (Press release). US House of Representatives Permanent Select Committee on Intelligence. Archived from the original on March 14, 2017. Retrieved March 13, 2018. ^ Katie Bo Williams (February 8, 2017). "Third Dem urges removal of Trump's pick for top CIA deputy". The Hill. Archived from the original on February 10, 2017. Retrieved February 14, 2017. Trump's pick of 30-year veteran Gina Haspel to serve as deputy director of the CIA – which is not a Senate-confirmable position – has reinvigorated fears that the administration is weighing a return to the use of banned techniques now considered torture, such as waterboarding and sleep deprivation. ^ Spencer Ackerman (February 15, 2017). "Deputy CIA director could face court deposition over post-9/11 role in torture". The Guardian. Retrieved February 15, 2017. In a court filing on Tuesday, attorneys for two CIA contract psychologists who helped design the agency's brutal interrogations for terrorism suspects have asked a federal judge to order Gina Haspel, a career CIA officer recently appointed as the agency's No2 official, to provide a deposition discussing her allegedly pivotal involvement in an episode the CIA has tried repeatedly to put behind it. ^ Spencer Ackerman (February 22, 2017). "DoJ moves to prevent CIA official from detailing role in Bush-era torture". New York City: The Guardian (UK). Retrieved March 27, 2017. The government asked the court to permit it to formally submit on 8 March its state-secrets argument preventing them and another CIA witness, James Cotsana, from being deposed. It is believed to be the first assertion of the state secrets privilege under the Trump administration. ^ Vitali, Ali; Mitchell, Andrea (March 13, 2018). "Trump fires Rex Tillerson, selects Mike Pompeo as new Secretary of State". NBC News. Retrieved March 17, 2018. ^ Demirjian, Karoun; Kim, Seung Min; DeBonis, Mike (March 13, 2018). "Nominees for secretary of state and CIA director face probable backlash in Senate". The Washington Post. Retrieved March 17, 2018. ^ Press, Associated (March 13, 2018). "Gina Haspel named by Trump to be CIA director, replacing Pompeo, who will replace Tillerson at State". The Washington Post. Associated Press. Retrieved March 13, 2018. ^ @realdonaldtrump (March 13, 2018). "Mike Pompeo, Director of the CIA, will become our new Secretary of State. He will do a fantastic job! Thank you to Rex Tillerson for his service! Gina Haspel will become the new Director of the CIA, and the first woman so chosen. Congratulations to all!" (Tweet). Archived from the original on March 13, 2018 – via Twitter. ^ Baer, Robert (March 19, 2018). "Gina Haspel Used To Work For Me. She's A Great Choice For CIA Director". NPR. Retrieved March 20, 2018. ^ Smith, David (March 14, 2018). "Rand Paul to oppose Gina Haspel as CIA director over her 'gleeful joy' at torture". The Guardian. Retrieved March 15, 2018. ^ He, Alan (March 16, 2018). "CIA Director nominee Gina Haspel did not mock tortured detainee". CBS News. Retrieved March 17, 2018. ^ Zengerle, Patricia (March 23, 2018). "McCain presses Trump CIA nominee over her record on interrogations". Reuters. Retrieved April 5, 2018. ^ Demirjian, Karoun (March 23, 2018). "McCain asks CIA director nominee Haspel to explain role in post-9/11 interrogations". The Washington Post. Retrieved April 5, 2018. ^ Frank, Thomas (March 23, 2018). "Fatima Boudchar Was Bound, Gagged And Photographed Naked. John McCain Wants To Know If Gina Haspel's Okay With That". Buzzfeed News. Retrieved April 5, 2018. ^ Goldman, Adam; Rosenberg, Matthew (April 20, 2018). "How the C.I.A. Is Waging an Influence Campaign to Get Its Next Director Confirmed". The New York Times. Retrieved April 27, 2018. ^ Demirjian, Karoun (April 25, 2018). "CIA refuses to declassify more information about Gina Haspel, Trump's pick to lead the agency". The Washington Post. Retrieved April 27, 2018. ^ "Former CIA chiefs endorse Haspel nomination". Politico. April 9, 2018. Retrieved May 15, 2018. ^ Greenwald, Glenn (May 8, 2018). "Will Democrats Unite to Block Trump's Torturer, Gina Haspel, as CIA Chief? If Not, What Do They #Resist?". The Intercept. Retrieved May 15, 2018. ^ Rizzo, Jennifer (April 9, 2018). "Former intelligence heavyweights endorse Trump's CIA pick". CNN. Retrieved May 15, 2018. ^ Syeed, Nafeesa (April 23, 2018). "Former Generals Oppose Trump's CIA Nominee". Bloomberg News. Retrieved May 15, 2018. ^ Krueger, Katherine (May 11, 2018). "WaPo Positions Support for Torturer as Vote for Feminism". Fairness and Accuracy in Reporting. Retrieved May 15, 2018. ^ Editorial (May 10, 2018). "Gina Haspel fails the test". The Washington Post. Retrieved May 15, 2018. ^ Pengelly, Martin (May 12, 2018). "Gina Haspel: Democrat Donnelly backs CIA pick beset by torture questions". The Guardian. Retrieved May 15, 2018. ^ "CIA Director Confirmation Hearing". C-SPAN. May 9, 2018. Retrieved May 11, 2018. ^ a b Myre, Greg (May 15, 2018). "Gina Haspel: CIA Should Not Have Carried Out 'Enhanced Interrogation'". NPR. Retrieved May 17, 2018. ^ Herb, Jeremy (May 16, 2018). "Committee approves Trump's CIA director nominee, setting up full Senate vote". CNN. Retrieved May 16, 2018. ^ Fandos, Nicholas (May 17, 2018). "Senate Confirms Gina Haspel to Lead C.I.A. Despite Torture Concerns". The New York Times. Retrieved May 19, 2018. ^ a b Herb, Jeremy; Diaz, Daniella (May 17, 2018). "Controversial nominee Gina Haspel confirmed as first female CIA director". CNN. Retrieved May 19, 2018. ^ "Haspel: Intelligence panel 'pleased' with decision to expel 61 Russian officers". February 4, 2019. Retrieved February 27, 2019. ^ Jansen, Bart (March 13, 2018). "Gina Haspel, nominated by Trump as first woman to lead CIA, has controversial past". USA Today. Retrieved March 13, 2018. ^ Manson, Katrina (March 16, 2018). "Gina Haspel, the undercover spy picked to head the CIA". Financial Times. Retrieved March 22, 2018. ^ "Trump Names Gina Cheri Haspel to Head CIA". Newsmax. Associated Press. Retrieved May 8, 2018. Wikimedia Commons has media related to Gina Haspel. This page was last edited on 24 April 2019, at 15:29 (UTC).